The whole dried plant of Chiretta constitutes the drug. Chiretta is very bitter in taste. It is a blood purifier that removes toxins from body. Due to this action it is a useful medicine to treat skin diseases. Swertia Chirayita is known by many common names such as Chirayata, Chiretta, kirata Tikta, Haima, Chiravata etc. This medicinal plant is a native of temperate Himalayas and found at an altitude of 1200–3000 m (4000 to 10, 000 ft) from Kashmir to Bhutan, and in the Khasi hills at 1200–1500 m (4000 to 5000 ft.). It is an important herb used in Ayurveda for treatment of fever, inflammation, skin diseases, intestinal parasites and diabetes. Many herbal medicines such as Chinnodbhavadi Kvatha Churna, Ayush-64, Himalaya Diabecon, Mensturyl syrup, Sudarshan churna, Mahasudarshan churna contains this medicinal herb. 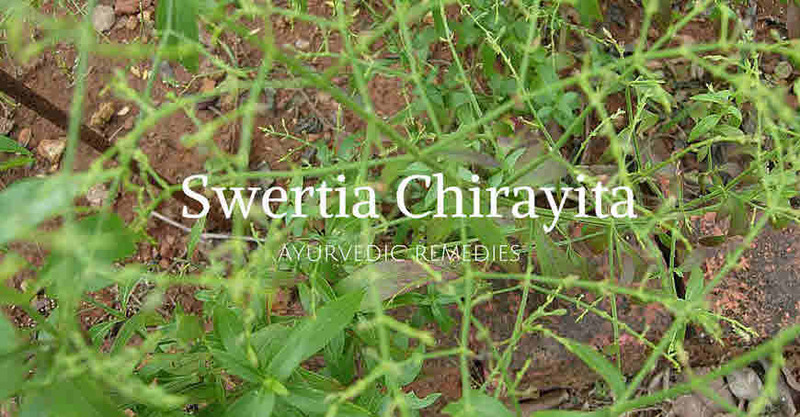 Chiretta is similar in action and properties to Andrographis paniculata or Kalmegha and both are known as Bhunimba in Ayurveda. Annual erect plant reaches height 60-125 cm;stem robust, branching, cylindrical below and four angled upwards;leaves ovate, broadly lanceolate, cordate at base;flowers numerous very small, greenish yellow, tinged purple in large leafy panicles;seeds smooth. Swertia Chirayita or Chiretta is very bitter in taste. It balances Pitta, Kapha and aggravates Vata/wind. The whole dried plant of Chiretta constitutes the drug. Chiretta is very bitter in taste. It is a blood purifier that removes toxins from the body. Due to this action it is a useful medicine to treat skin diseases. It has blood sugar lowering effect and a useful cure for diabetes. It has laxative properties and cures constipation. It is indicated in hysteria and convulsions. Chiretta is a good medicine to treat digestive system ailments such as indigestion, diarrhea, low appetite etc. Its root is useful in checking hiccups and vomiting. It is taken in doses of 0.5 to 2 grams with honey. Chiretta whole plant is used to treat fever especially sannipata fever such as malarial fever. For treatment of fever, whole plant is dried in shade and pulverised to get powder. This powder has fever reducing (fever due to known or unknown reasons, malarial fever), anti-inflammatory (inflammation reducing), anthelmintic, the liver protecting, anti-diabetic (blood sugar lowering), laxative and tonic properties. The dosage of this powder for adults is 1-3 grams and for children 250 mg to 500 mg, with water. The dose of decoction for adults is 25-30 ml and for children, it is 5 ml to 10 ml, to be taken twice a day after meals. Although no toxic effects are reported with Chiretta. But person taking oral blood sugar lowering medicines should take this herbal powder under medical supervision.